With a 60 percent chance of rain showers forecasted for the second stop in the Club Challenge Series, many wondered if the Fairly Reliable Bobs event would even occur. After heavy showers pounded the faciliy during the early part of the afternoon, the hard-working track staff went to work on drying things out with every piece of equipment on the ground, including the high-powered blower tractor, PowerBoss track vacuum/scrubber/torch, hand blowers and the J-34 Jet-powered Dryer. Following two hours of drying out the majority of the race surface, time trials got underway at just after 4 pm. And as luck would have it, unfortunately racing came to a halt at the conclusion of the first class (Bracket #5) when more rainfall pounded the raceway. The good news though was the weather gods provided a reprieve in the wet weather pattern, paving the way for more practice and racing, which ensued over the eighth-mile distance. Five different clubs made their way into the Pepsi Winner’s Circle by the end of the evening. Remarkably enough, the string of eleven consecutive round wins by the chopped Luv truck of Mike Osich (dating back to his victory at the first Club race) came to an end in Club Bracket #1. Osich went red by just .008 of a second after collectively running 6.51, 6.51, bye, 6.52, 6.52, and yet another 6.51 on a 6.51 dial to hand Ken Windley and the Melba Outlaws their first title of the season. Congratulations also goes out to each of the other four champions, which included: Carl Youngstrom (PSI Racing), Shayne Schaefer (Notorious Hot Shots), Greg Sabatino (Down `n Dirty), and Monte Benson (The Hustlers). In an ultra-competitive season for teams points at all three “Cup” levels, all eyes will now focus on the next event on schedule, which will take place on Friday, June 7. Ken Windley, Melba Outlaws, .074, 6.41 (6.43 dial) 105.88 def. 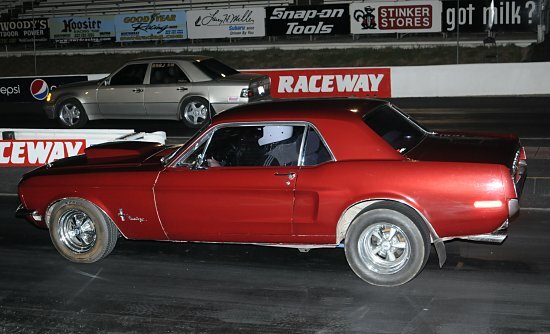 Mike Osich, Down `n Dirty, -.008 foul, 6.51 (6.51 dial) 105.26. Semi-final-Lee Dougal, Down `n Dirty. Quarters-Phillip Comegys, PSI Racing; Bryan Griggs, Kuna Knuckle Draggers. Carl Youngstrom, PSI Racing, -.018, 7.73 (7.74 dial) 88.13, def. Rod Mills, The Hustlers, -.046 foul, 7.86 (7.85 dial) 87.87. Quarters-Brady Jesser, Flying Brick; Terol Rasmussen, Melba Outlaws; Tom Ash, Melba Outlaws. Shayne Schaefer, Notorious Hot Shots, .238, 8.25 (8.29 dial) 82.73, def. Stephanie Meimann, Modern Rodders, -.040 foul, 9.42 (9.44 dial) 77.04. Quarters-Ashton Davis, Down `n Dirty; Susan Wikfors, PSI Racing; Paul Wallace, Valley Vettes. Greg Sabatino, Down `n Dirty, .119, 8.40 (8.40 dial) 82.62, def. Steve Shideler, Valley Corvettes, -.045 foul, 8.90 (8.85 dial) 79.44. Quarters-Jena Shadwick, AMC Racing; Bill Belau, Sons of Speed; Shannon Dougal, Naughty Girls. Monte Benson, The Hustlers, .011, 10.69 (11.00 dial) 65.93, def. Dave Maiden, The Hustlers, -.083 foul, 10.40 (10.53 dial) 69.83. Quarters-Robert Smith, Down `n Dirty; Jeff Burns, Down `n Dirty; Kane Thomasson, The Barons.